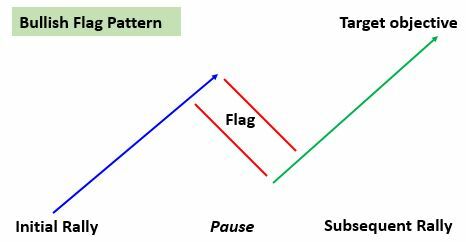 Technical analysis or Charting allows investors to use a range of patterns to assist them with timing their entry to and exit from positions. 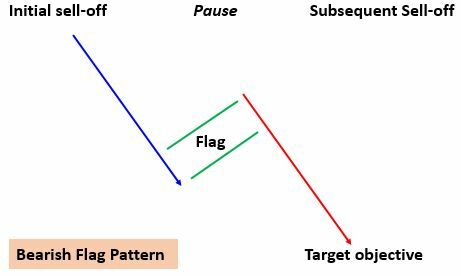 Flags, essentially continuation patterns like triangles and pennants, are some of the most helpful within a trending market – rising or falling – signalling that after a short pause the prevailing trend should continue. The initial rally into the flag – the flagpole – can be steep or gradual. The Flag represents a pause to consolidate, retracing a small part of the initial rally within a tight channel. A breakout from this channel is the first hint that a Bullish flag could be in the making. 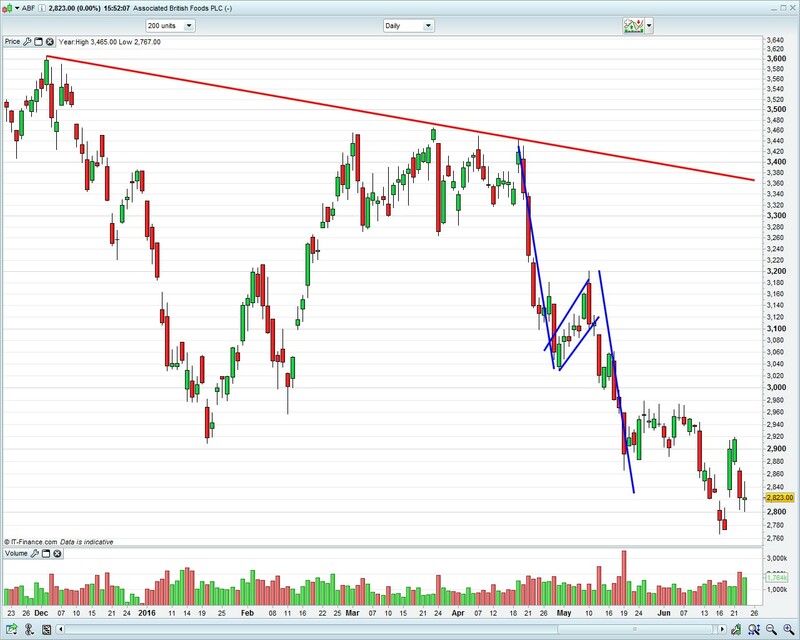 Once the shares break out from the flag, it is possible that another rally – the same size as the first – could be delivered. The above trading example shows a 130p rally (930-800p) followed by a 70p flag decline (930-860p), followed by a repeat 130p rally (860-990p). The initial sell-off into the flag – the flagpole – can be steep or gradual. 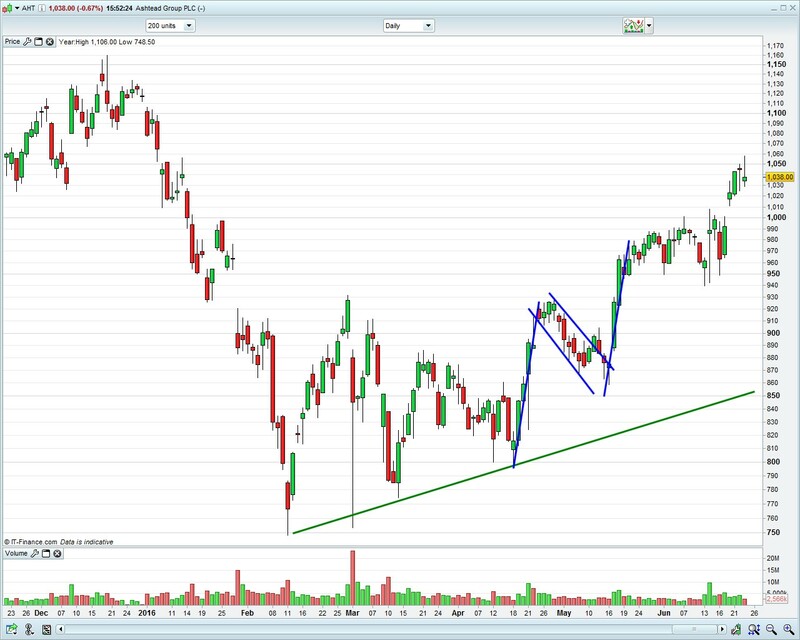 The Flag represents a pause to consolidate, retracing a small part of the initial sell-off within a tight channel. A break-down from this channel is the first hint that a bearish flag could be in the making. The above trading example shows a 400p sell-off (3440-3040p) followed by a 160p flag rally (3040-3200p), followed by a repeat 340p sell-off (3200-2860p). Whilst trade objectives are calculated by assuming and projecting a repeat of the initial up or down move, note that Bullish or Bearish flags don’t always deliver exactly the same move. Sometimes they undershoot. Sometimes they overshoot. And the flag itself is not always a neat rising or falling channel. What is most important is that overall pattern respects the general steps mentioned above.